Ask guitar players my age (even younger ones) who their guitar heroes are and you will likely hear the same five names in many replies: Jimi Hendrix, Jimmy Page, Eric Clapton, Jeff Beck, and Eddie Van Halen. Which is understandable since they each are amazing, creative players who heavily influenced the way everyone who came after them plays guitar. I certainly am a fan of them also, but I learned to appreciate them more as I entered my twenties. They didn’t resonate with me as a teen in the 1970s like other players did. I seemed to have had a more unusual set of guitar heroes. Stylistically, none of then are very similar. Some of them you probably wouldn’t have thought of and some you may not even know of. It would be wrong if I didn’t start this list with the man who had the most influence on my playing, my guitar teacher Robert Richter. Robert Richter was a local jazz musician in the Ann Arbor Michigan area. Although he was a jazz guitarist he could play any style of music, and he taught me to appreciate all types of music, not just rock. The most amazing thing I remember about him was at the end of each lesson, he would take my blank manuscript (sheet music) book and write out my next lesson song, including chords and melody, from memory. Or maybe he just thought of the music in his head and wrote it down. Either way I was always amazed. I can do that to an extent now, but slowly. He cranked out pages of complex jazz music in a few minutes. He never became famous but he was certainly my hero. I would have to say my first guitar hero was Randy Bachman of Bachman Turner Overdrive fame. Much of BTOs music was simple riff based rock, which appealed to me greatly when I first started playing guitar at age 12. And Randy has real a knack for writing catchy guitar hooks. BTO also had a few songs that included some jazzy guitar playing like Blue Collar, Looking Out For #1, and Welcome Home. I liked the jazzy side of his playing a lot. I soon discovered that he was a very versatile guitar player who also played lots of great guitar in the band The Guess Who. I am not sure why but 1976 was the year I became aware of most of my guitar heroes. I had been taking guitar lesson for a couple of years when my teacher told me to go get the Deluxe Santana songbook. I had heard Black Magic Woman on the radio but I wouldn’t say I was a fan of Santana. But once I started learning the songs and really listened to Carlos Santana’s playing, I discovered that he played with a great amount of emotion. With almost a vocal quality to his playing. I strove for that kind of emotion in my playing. The album Moonflower came out the next year with a mix of live and studio music. That cemented the deal for me. Carlos Santana became one of my guitar heroes. It was also 1976 when one of my guitar playing friends told me I had to get the album Robin Trower Live. I took his word for it and it was like a lightning bolt when I first heard it. His guitar sounded huge! I loved his playing. Robin Trower took a lot of criticism back then for sounding “too much like Jimi Hendrix” (imagine that happening today.) But I always thought his playing was bluesier than Hendrix, and Hendrix was more psychedelic and R&B based. Anyway, that Live album put him on my hero list. Having been introduced to jazz guitar by my guitar teacher (and a little bit by Randy Bachman.) 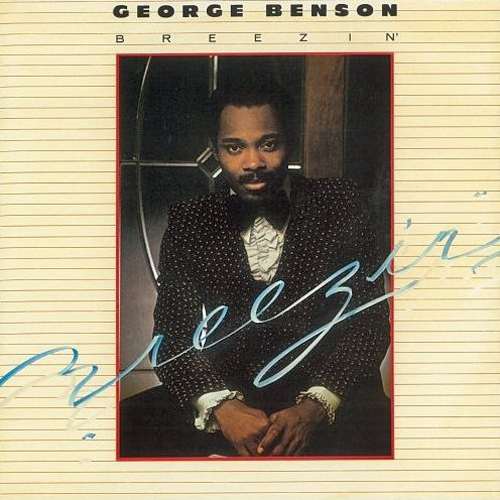 It was no surprise that when the album Breezin’ came out the same year that I would become a George Benson fan. For someone like me, a guitar player just getting into jazz, this was a perfect album. Some die hard jazz fans called the album a sell out, but I don’t see how making music people like is selling out. And the album contains some truly great guitar playing. He eventually became more pop/R&B oriented in his albums, but I still love his guitar playing. The final player of 1976 that had a big impact on me was Peter Frampton. I know what your thinking. Peter Frampton? True, he was sort of a teen idol back then, but it was his guitar playing that caught my attention. He wasn’t the most groundbreaking guitarist of the day, but he always played tasteful parts and his tone was always perfect. His soloing is very melodic, which I like. And of course, the voice box effect on Show Me The Way and Do You Feel Like I Do was something new and very cool. I think he is quite underrated as a guitarist. My last and favorite guitar hero came at the turn of the decade. And he came from a whole different direction. About that time I had started listening to what was called “Contemporary Christian Music.” There were some surprisingly good guitar players in some of those early CCM bands, like Randy Thomas of Sweet Comfort Band and James Hollihan, Jr. with Russ Taff, but a popular song on Christian radio that caught my ear was an acoustic song called Spend My Life With You by Phil Keaggy. It had great acoustic guitar playing and even an acoustic guitar solo. I bought the album and discovered that Phil also played electric guitar - extremely well. It is rare for someone to be so accomplished on both acoustic and electric guitar. A year or so later I went to see him play at a local high school gym. It was an unforgettable experience. My wife and I got there early and got to sit close. I could see everything he was doing on guitar. I wasn’t prepared. His playing was mind-blowing. He played electric and acoustic with incredible technique and ease, yet it wasn’t showing off, it was all very musical. Back then guitar player often did solo segments in the middle of a set to show off their guitar tricks. Phil also did a solo segment but it wasn’t like any other I had seen. He simply improvised music moving from one idea to another and one style of music to another. I was dumbfounded. I almost wanted to quit playing guitar knowing I would never be able to do what I had just seen. Over the years he has become a master at looping also. Phil Keaggy is simply the most complete and talented guitar player I have ever seen or heard. He will always be my #1 guitar hero.